Tesla Model S – Best Car Ever! 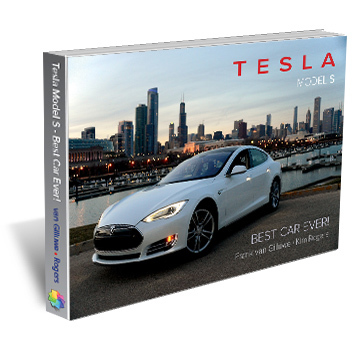 Explore the revolutionary Tesla Model S with this comprehensive, compact handbook. It’s the perfect keepsake for the Tesla enthusiast or owner. As an early Tesla Model S owner who even took a test ride in the prototype, we’ve collected our unique insights, photos and historical knowledge of Tesla into this fun, easy to read book. No car has moved so quickly from an unknown to one of the most desired cars in the world! Discover how the original Model S was created from concept through production. We reveal it all with stunning photos, unusual cool facts, handy owner tips, photo timelines and much more. And of course, we’ll tell you why it was the most innovative car designed and still is the Best Car Ever! Specs: 224 pages, Full color, 1.2 lbs. Notes: Due to licensing restrictions, we can only ship books to Canada, Mexico and USA. eBook is available everywhere. Tesla trademarks used under license. Elon Musk: Tesla, SpaceX, and the Quest for a Fantastic Future provides the first inside look into the extraordinary life and times of Silicon Valley’s most audacious entrepreneur. Written with exclusive access to Musk, his family and friends, the book traces the entrepreneur’s journey from a rough upbringing in South Africa to the pinnacle of the global business world. The Car Hacker’s Handbook will give you a deeper understanding of the computer systems and embedded software in modern vehicles. It begins by examining vulnerabilities and providing detailed explanations of communications over the CAN bus and between devices and systems.While the book is not specific to Tesla, much of the information is directly applicable to all Tesla models.